Udobna sjedišta vrlo ljubazni vozači . We arrived the tirana 1 hour erlier. This is a good thing for me, but it would be bad. Vozaci su bili iznimno ljubazni,kulturni. Divers could show more pride in their bus. Windows were quite dirty and made seeing the beautiful scenery more difficult. Start using tickets on your smart phone. Driver even asked for it! Grijanje je radilo cijelom putem vozač nije znal ugasiti, na iskrcaju kofera u Splitu, zamoljen za pomoc vozač je rekao da on ne moze to izvaditi. Toliko užasno da bi prijevoznika trebalo tužiti i ukinuti liniju. 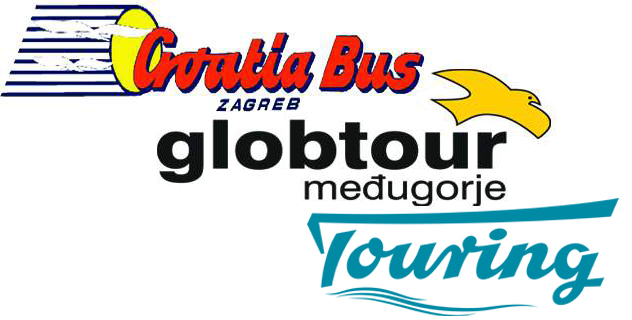 Globtour with base in Medjugorje in Bosnia and Herzegovina is one of the fastest growing bus companies in the Balkan Region. The main activity of the company is operating domestic long distance buses in Croatia and BiH as well International bus routes to most European countries. Domestic lines in Croatia are operated by the daughter company Croatia bus d.o.o. Routes with frequent departures include Split - Dubrovnik, Dubrovnik - Split, Zagreb - Dubrovnik and Dubrovnik - Zagreb. The international bus routes operated by Globtour include lines to and from the following countries, Sweden, Norway, France, Germany, Austria, Switzerland, Serbia, Montenegro. In addition to operating regular bus lines, Globtour also offer bus rental and organized bus tours trough it sister company G-tours. The Globtour group has a total of around 160 buses. How to recognize the buses from Globtour? The buses from Globtour are usually in white or grey colour with the companies yellow logo ( a seagull) on the side.